Bright Week is normally a week when no one calls the priest, when he tries to leave little for himself to do, except perhaps for a couple of extra Paschaltide services. I wish I could say that this Bright Week has been no exception to that rule, but for various reasons (some of which are my own fault) it hasn’t, so perhaps recovery will have to wait until next week. In any event, it’s understandably been a few weeks since I posted anything here, so I thought I might catch up on a few brief pieces of news and such. 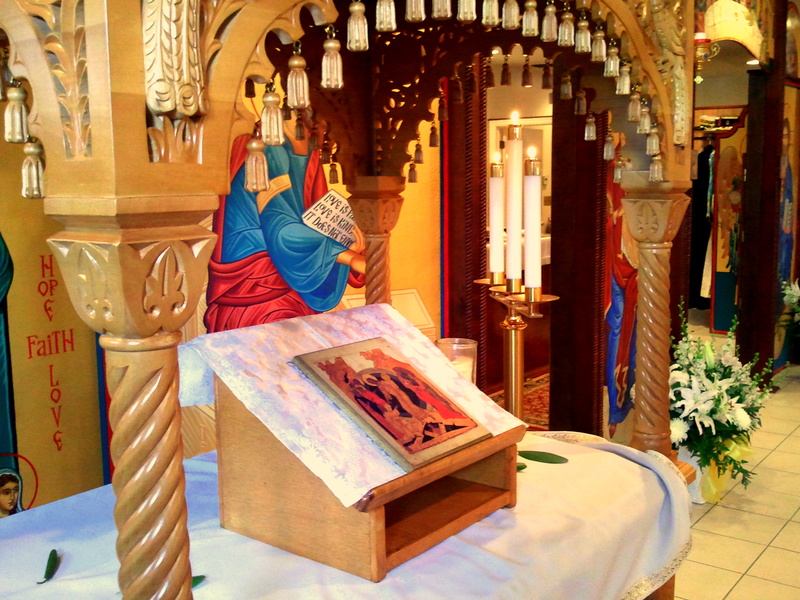 Concerning Lent, Holy Week and Pascha, I felt that things went quite well at St. Paul’s here in Emmaus. Musically and liturgically, things came together quite well, and that is the basis for everything else. The rhythm of Christian life is ultimately liturgical so (if I may paraphrase some wise person whose name now escapes me), when liturgy is good, everything is good. I continually find that the people who are best able to say “it is well with my soul” are those for whom corporate worship is not just a Sunday-only affair. So by any real measure, this past season has been quite good. I have also noticed that there have been more people who have begun to embrace this truth, and we have seen some fruit borne out of this cultivation of souls. It was wonderful to have a chrismation on Holy Saturday this year, and those who remember my interview with actor and musician Jonathan Jackson should be glad to hear that he and his family were all baptized into the Orthodox Church on the same day at their parish in California. This week (Thursday, in fact) also featured a similar event for me: fourteen years since I was received into Orthodoxy at All Saints Orthodox Church in Raleigh, North Carolina. Every time I mark this anniversary, it seems like such a long time ago and also a short time ago. This next week, my wife and I will mark ten years since we first met each other. Again, a long time and a short time. It was also good this week to celebrate some Bright Week services with my friend and neighbor Fr. Noah, who is pastor of St. Philip’s in Souderton, Pennsylvania. We both took the opportunity to function as chanters at our respective churches while the other filled in at the altar. I very rarely get to serve as a chanter at liturgy, so the one we did here in Emmaus was a rare treat for me. This week, I also delivered a lecture at a class on Orthodox Christianity at Muhlenberg College, entitled “A Divine Ecology: An Orthodox Christian Vision for the Environment,” courtesy of the inestimable Dr. Tighe, an Eastern Catholic professor of history who is quite kind to the Orthodox and well known in small-C-catholic Internet worlds. You may also have seen his work in Touchstone or First Things. On a more familial note, we are now only a few weeks away from the birth of our third child, a boy, to be named Raphael Joseph Caedmon. His coming is welcome, mainly of course because my wife is rather tired and would like to get about the business of raising him. This being our third child, we will be crossing a new threshold of parenting. It seems daunting, of course, but we have multiple friends and relations who have raised far more than three (and both of us come from sets of siblings of at least three), so we do have some examples to draw on. Still, it will be a new level. Speaking of babies, my Red Spot Nyassae Cichlid recently gave birth to about forty or so little fry. I have no idea who the father might be, but it’s probably one of the other Aulonocara cichlids in my ninety gallon aquarium. On that same note, my post-Paschal gift to myself is another aquarium (yes, I have four now), a fifty-five gallon one for my office at the church. I’m decorating this one far more cheaply (and, I think, effectively) than I have my others (having learned a few things), mostly with rocks in a kind of neolithic ruins look. Think “Stonehenge with caves around it,” and you’ll be in the right mindset. I plan to feature some New World cichlids therein. Now that the great whirlwind of Great Lent, Holy Week and Pascha is behind me for the year, I’m looking forward to getting back to work on the new book. Fr, will the child’s patron be Raphael or St Joseph? Yes! But don’t forget St. Caedmon. I was also chrismated on Holy Saturday, and I would like to thank you for sharing your enlightening and often amusing words. Roads from Emmaus and Orthodoxy & Heterodoxy were hugely helpful in my journey to, and final decision to join, the one Holy Catholic and Apostolic Church. Keep fighting the good fight!